noeldhiraj April 15, 2016 April 30, 2018 Oh My Foodness! A few months back, a colleague of mine looked very worried. I asked him what’s the matter so he said and I quote “My wife is visiting her hometown but that’s not why I’m worried. I knew to cook only 1 dish and now even that is banned”. Well this is the time when maggi was banned. Fast forward to the present day – I met him recently and he looked worried again. I asked what’s up and he said “now that maggi is no longer banned my wife is not making any plans of visiting her hometown”…Lol!! Jokes apart, I’m sure most of you would agree with me when I say, Maggi is one such dish that everyone has good memories linked to because it was/is cooked during a study night or even during a late night house party. It has been and will be the most relied upon dish ever! The best part is it can be cooked in 2 minutes (well not literally but you get the point). But when you think about it, it is such a simple dish and there’s nothing extraordinary about it at all. Then came along Hungry Head, which took the simplest of dishes and made it into something which is so incredible. At this moment I want to say that I am greatful to Zomato through which I was able to find this true hidden gem of a restaurant. Almost everything listed in their menu is made out of some form of maggi along with added flavours/spices. 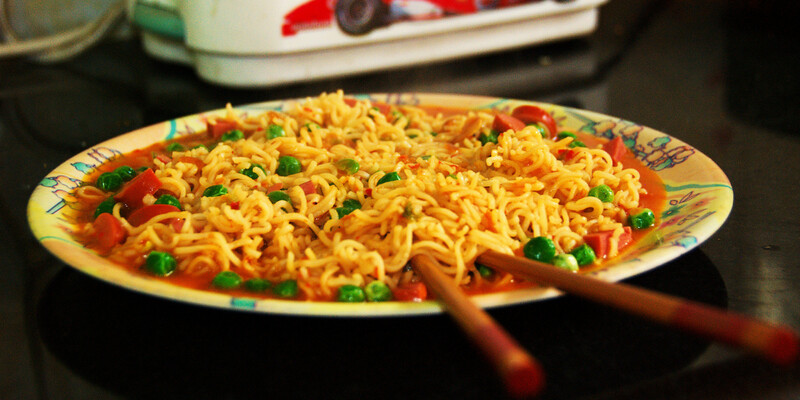 Exotic Maggi: more complex flavours and this is where you should ideally pick a dish from if you ask me. A little more expensive than favourite category but definitely worth each buck. I have tried farm to wok (3/5), biryani (4/5), 3 cheese (4/5), oye punjabi (3/5), khow suey (5/5) and this is my favourite of them all. Khow suey also happens to be my favourite Burmese dish and trust me this tastes so similar with all the fried onions, garlic and roasted peanuts. Bhel Maggi: never tried this yet. Sub Maggi: maggi in a 6 incher. An excellent twist to a regular subway sandwich. I tried the red dragon magsub and it was yum. Burger Maggi: the patty is made up of boiled and mashed maggi with added flavours and spices. It is a delight right from the first bite till the last. I have tried only the classic magburg until now but I’m going to try the other variants soon. Pizza Maggi: haven’t tried this yet. Fries: With 12 different variants, everyone has something they will like for sure. I have also tried their Mango flavored Ice Tea and it was lovely. It maintained it’s refreshing hint of ice tea with a blast of mango flavour. The only dish i have been dying to try from their menu is the blooming bread but unfortunately it is always out of stock. I must have called them about 20 times in the last couple of months asking if they have started serving this dish again but every time I get a disappointing answer. Eventually the person who answers the phone also recognized me and told me the story being the missing blooming breads. He said it’s a baked dish and the bakery they had a contract with has shut down. So they are in talks with other bakeries who can fulfil their order and that’s taking more time than expected. I sure hope they figure out a way to stock up those blooming breads soon because I am growing restless with each blooming day..Hehe! !